Our national defense requires that sensitive information be maintained in confidence to protect our citizens, our democratic institutions, and our homeland. Protecting information critical to our nation’s security is the responsibility of each individual who is granted access to classified information. Any unauthorized disclosure of classified information is a violation of our law and compromises our national security. The recent irresponsible disclosure by WikiLeaks has resulted in significant damage to our national security. Any failure by agencies to safeguard classified information pursuant to relevant laws, including but not limited to Executive Order 13526, Classified National Security Information (December 29, 2009), is unacceptable and will not be tolerated. • Each department or agency that handles classified information shall establish a security assessment team consisting of counterintelligence, security, and information assurance experts to review the agency’s implementation of procedures for safeguarding classified information against improper disclosures. 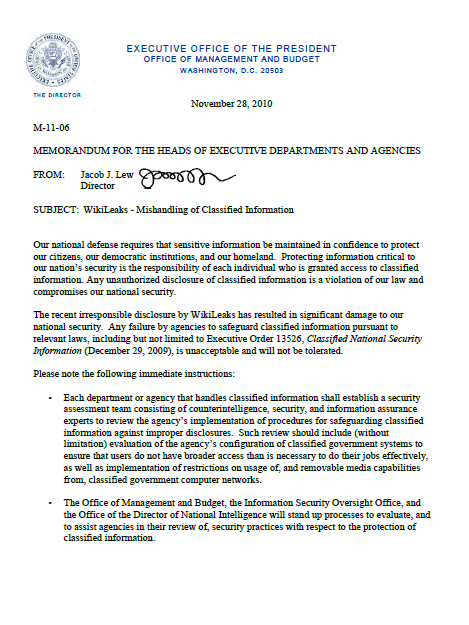 Such review should include (without limitation) evaluation of the agency’s configuration of classified government systems to ensure that users do not have broader access than is necessary to do their jobs effectively, as well as implementation of restrictions on usage of, and removable media capabilities from, classified government computer networks. • The Office of Management and Budget, the Information Security Oversight Office, and the Office of the Director of National Intelligence will stand up processes to evaluate, and to assist agencies in their review of, security practices with respect to the protection of classified information.